Hops are the female cone-like flowers of the hop bine which impart bitterness, flavor and aroma to beer. Hops also are a natural preservative that inhibit some bacterial growth in a finished brew. Hops are available in whole flowers or pellets. Packages will be marked with the Alpha Acid (AA) rating. The AA rating multiplied by the ounces will give you the Alpha Acid Units (AAU) or Homebrew Bittering Units (HBU) for the recipe. International Bittering Units (IBU) is a measure of the actual bitterness in a finished beer with consideration of wort volume, boil length, and original gravity. Hops are typically added at any of four main times during the brewing process. 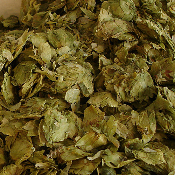 Hops used primarily for bittering are added at the beginning of the boil and usually boil for about 60 minutes or more. Hops used primarily for flavoring are added in the middle of the boil and typically boil for 20-30 minutes. Hops used primarily for aroma are added at the end of the boil and typically boil for about 0-15 minutes. Finally, "Dry Hopping" refers to the practice of soaking hops in the almost-finished beer for an intense aroma of fresh hops. Use whole hops in a hop bag, and place in the secondary fermenter, or, if using just a single stage fermentation, place in the primary at the conclusion of fermentation and leave for five to seven days. This process works especially well for big hop "nose" beers such as IPA, ESB, Pale or Amber styles. Kent Goldings, Cascade and Saaz work very well. Please Note: Due to fluctuations in hop supply and demand some hop varieties we normally carry may not be in stock. 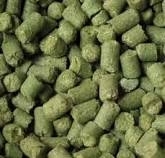 We may be able to substitute a different style (e.g., whole hops for pellets), or a different variety that is a suitable substitute. 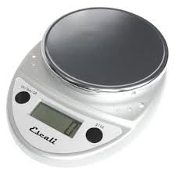 We will email you with possible changes before shipping the order. If you have a specific question on availability please write us at sales@oldwestbrew.com before placing your order.